Some glimmers of hope for the Japanese economy with the release earlier today of the PIP data (Preliminary Industrial Production) which surprised the markets by coming in at an encouraging 1.6% against a forecast of 0.8%, with output rising twice as fast as expected in March, the first gain in 6 months. In addition manufacturers are forecasting further gains in production in the coming months which would suggest that Japan may now be seeing the beginning of a bottoming out after one of the sharpest declines on record in the first three months of this year. Other items of fundamental news on the economic calendar for Japan have included the overnight call rate which was left unchanged at 0.1%, housing starts which came in better than expected at -20.7 against a forecast of -22.5 and we are still awaiting the Bank of Japan outlook report and subsequent press conference which should be on today’s agenda at some point. 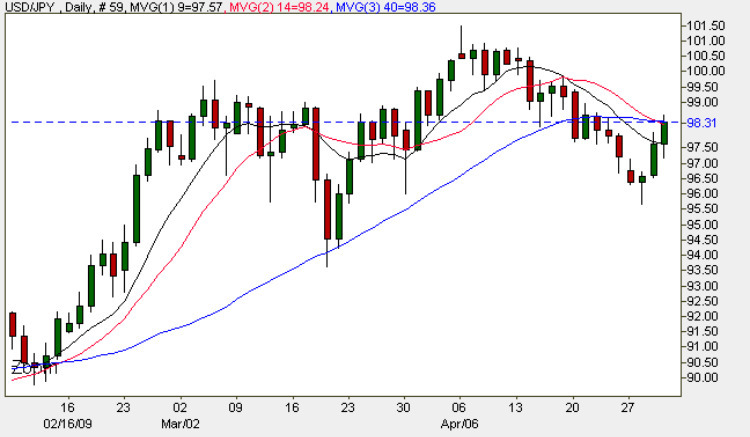 The tone taken by the BOJ will influence the Japanese Yen. From a technical perspective yesterday’s short squeeze higher in the wake of a national holiday in Japan has carried through into today’s trading breaking above both the 9 and 14 day moving averages. However, this move needs to be seen against the broader context of several factors including the raft of economic data outlined above, thin trading volumes because of various holidays, a host of US data, unpredictable moves in the US dollar, the ongoing threat from swine flu, and finally the impending BOJ statement. My trading suggestion for the dollar yen is therefore to wait for the dust to settle before re-entering the market which may not be until early next week because my view is that we are likely to see a further period of consolidation between 99.50 and 95.50 and if and until this range is broken with momentum then trading will be limited to intra day opportunities using the shorter time frame charts.